Emma Walmsley became CEO on 31 March 2017 and is the first female CEO of the company. The company has a primary listing on the London Stock Exchange and is a constituent of the FTSE 100 Index. As of August 2016 it had a market capitalisation of £81 billion (around $107 billion), the fourth largest on the London Stock Exchange. It has a secondary listing on the New York Stock Exchange. GSK's drugs and vaccines earned revenue of £21.3 billion in 2013. Its top-selling products that year were Advair, Avodart, Flovent, Augmentin, Lovaza and Lamictal. GSK's consumer products, which earned revenue of £5.2 billion in 2013, include Sensodyne and Aquafresh toothpaste, the malted-milk drink Horlicks, Abreva for cold sores, Breathe Right nasal strips, Nicoderm and Nicorette nicotine replacements, and Night Nurse, a cold remedy. The company developed the first malaria vaccine, RTS,S, which it said in 2014 it would make available for five percent above cost. Legacy products developed at GSK include several listed in the World Health Organization Model List of Essential Medicines, such as amoxicillin, mercaptopurine, pyrimethamine and zidovudine. In 2012 GSK pleaded guilty to promotion of drugs for unapproved uses, failure to report safety data, and kickbacks to physicians in the United States and agreed to pay a $3 billion (£1.9bn) settlement. It was the largest health-care fraud case to date in that country and the largest settlement by a drug company. Glaxo Laboratories was incorporated as a distinct subsidiary company in London in 1935. Joseph Nathan's shareholders reorganised the group's structure in 1947 making Glaxo the parent  and obtained a listing on the London Stock Exchange. Glaxo acquired Allen & Hanburys in 1958. The Scottish pharmacologist David Jack was hired as a researcher for Allen & Hanburys a few years after Glaxo took it over; he went on to lead the company's R&D until 1987.:306 After Glaxo bought Meyer Laboratories in 1978, it began to play an important role in the US market. In 1983 the American arm, Glaxo Inc., moved to Research Triangle Park (US headquarters/research) and Zebulon (US manufacturing) in North Carolina. Burroughs Wellcome & Company was founded in 1880 in London by the American pharmacists Henry Wellcome and Silas Burroughs. The Wellcome Tropical Research Laboratories opened in 1902. In the 1920s Burroughs Wellcome established research and manufacturing facilities in Tuckahoe, New York,:18 which served as the US headquarters until the company moved to Research Triangle Park in North Carolina in 1971. The Nobel Prize winning scientists Gertrude B. Elion and George H. Hitchings worked there and invented drugs still used many years later, such as mercaptopurine. In 1959 the Wellcome Foundation bought Cooper, McDougall & Robertson Inc to become more active in animal health. Glaxo and Wellcome merged in 1995 to form Glaxo Wellcome plc. Glaxo Wellcome restructured its R&D operation that year, cutting 10,000 jobs worldwide, closing its R&D facility in Beckenham, Kent, and opening a Medicines Research Centre in Stevenage, Hertfordshire. Also that year, Glaxo Wellcome acquired the California-based Affymax, a leader in the field of combinatorial chemistry. By 1999 Glaxo Wellcome had become the world's third-largest pharmaceutical company by revenues (behind Novartis and Merck), with a global market share of around 4 per cent. Its products included Imigran (for the treatment of migraine), salbutamol (Ventolin) (for the treatment of asthma), Zovirax (for the treatment of coldsores), and Retrovir and Epivir (for the treatment of AIDS). In 1999 the company was the world's largest manufacturer of drugs for the treatment of asthma and HIV/AIDS. It employed 59,000 people, including 13,400 in the UK, had 76 operating companies and 50 manufacturing facilities worldwide, and seven of its products were among the world's top 50 best-selling pharmaceuticals. The company had R&D facilities in Hertfordshire, Kent, London and Verona (Italy), and manufacturing plants in Scotland and the north of England. It had R&D centres in the US and Japan, and production facilities in the US, Europe and the Far East. In 1848 Thomas Beecham launched his Beecham's Pills laxative in England, giving birth to the Beecham Group. 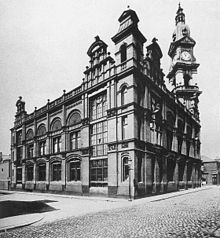 In 1859 Beecham opened its first factory in St Helens, Lancashire. By the 1960s Beecham was extensively involved in pharmaceuticals and consumer products such as Macleans toothpaste, Lucozade and synthetic penicillin research. John K. Smith opened his first pharmacy in Philadelphia in 1830. In 1865 Mahlon Kline joined the business, which 10 years later became Smith, Kline & Co. In 1891 it merged with French, Richard and Company, and in 1929 changed its name to Smith Kline & French Laboratories as it focused more on research. Years later it bought Norden Laboratories, a business doing research into animal health, and Recherche et Industrie Thérapeutiques in Belgium in 1963 to focus on vaccines. The company began to expand globally, buying seven laboratories in Canada and the United States in 1969. In 1982 it bought Allergan, a manufacturer of eye and skincare products. SmithKline & French merged with Beckman Inc. in 1982 and changed its name to SmithKline Beckman. In 1988 it bought its biggest competitor, International Clinical Laboratories, and in 1989 merged with Beecham to form SmithKline Beecham plc. The headquarters moved from the United States to England. To expand R&D in the United States, the company bought a new research center in 1995; another opened in 1997 in England at New Frontiers Science Park, Harlow. Glaxo Wellcome and SmithKline Beecham announced their intention to merge in January 2000. The merger was completed in December that year, forming GlaxoSmithKline (GSK). The company's global headquarters are at GSK House, Brentford, London, officially opened in 2002 by then-Prime Minister Tony Blair. The building was erected at a cost of £300 million and as of 2002 was home to 3,000 administrative staff. GSK completed the acquisition of New Jersey-based Block Drug in 2001 for US$1.24 billion. In 2006 GSK acquired the US-based consumer healthcare company CNS Inc., whose products included Breathe Right nasal strips and FiberChoice dietary supplements, for US$566 million in cash. Chris Gent, previously CEO of Vodafone, was appointed chairman of the board in 2005. GSK opened its first R&D centre in China in 2007, in Shanghai, initially focused on neurodegenerative diseases. Andrew Witty became the chief executive officer in 2008. Witty joined Glaxo in 1985 and had been president of GSK's Pharmaceuticals Europe since 2003. In 2009 GSK acquired Stiefel Laboratories, then the world's largest independent dermatology drug company, for US$3.6bn. In November the FDA approved GSK's vaccine for 2009 H1N1 influenza protection, manufactured by the company's ID Biomedical Corp in Canada. Also in November 2009 GSK formed a joint venture with Pfizer to create ViiV Healthcare, which specializes in HIV research. In 2010 the company acquired Laboratorios Phoenix, an Argentine pharmaceutical company, for US$253m, and the UK-based sports nutrition company Maxinutrition for £162 million (US$256 million). In 2011, in a $660-million deal, Prestige Brands Holdings took over 17 GSK brands with sales of $210 million, including BC Powder, Beano, Ecotrin, Fiber Choice, Goody's Powder, Sominex and Tagamet. In 2012 the company announced that it would invest £500 million in manufacturing facilities in Ulverston, northern England, designating it as the site for a previously announced biotech plant. In May that year it acquired CellZome, a German biotech company, for US$98 million, and in June worldwide rights to alitretinoin (Toctino), an eczema drug, for $302 million. In 2013 GSK acquired Human Genome Sciences (HGS) for $3 billion; the companies had collaborated on developing the lupus drug Belimumab (Benlysta), albiglutide for type 2 diabetes, and darapladib for atherosclerosis. In March 2014, GSK paid $1 billion to raise its stake in its Indian pharmaceutical unit, GlaxoSmithKline Pharmaceuticals, to 75 percent as part of a move to focus on emerging markets. In April 2014 Novartis and Glaxo agreed on more than $20 billion in deals, with Novartis selling its vaccine business to GSK and buying GSK's cancer business. In February 2015 GSK announced that it would acquire GlycoVaxyn, a Swiss pharmaceutical company, for $190 million, and in June that year that it would sell two meningitis drugs to Pfizer, Nimenrix and Mencevax for around $130 million. Philip Hampton, at that time chair of the Royal Bank of Scotland, became GSK chairman in September 2015. In September 2016, the company announced that Witty would be succeeded as CEO by Emma Walmsley in March 2017; Walmsley was a management professional originally from Lancashire with a background in marketing. In December 2017, Reuters reported that Glaxo had increased its stake in its Saudi Arabian unit to 75% (from 49%) taking over control from its Saudi partner Banaja KSA Holding Company. With respect to rare diseases, the company divested its portfolio of gene therapy drugs to Orchard Therapeutics in April 2018. In late November Reuters reported that Unilever was in prime position to acquire GSK's interest in its Indian unit, GlaxoSmithKline Consumer Healthcare Ltd, in a sale that could generate around $4 billion for the company. GSK currently holds a 72.5% shareholding. Nestlé and Coca-Cola have also been reported to be interested in the business unit as they look to strengthen their presence in India. On 3 December 2018, GSK announced that Unilever would acquire the Indian-listed GlaxoSmithKline Consumer Healthcare business for $3.8 billion (£2.98 billion). Unilever will pay the majority of the deal in cash, with the remaining being paid in shares in its Ondian operation, Hindustan Unilever Limited. Upon completion, GSK will then own around 5.7% of Hindustan Unilever Limited, selling those shares in a number of tranches. The same day, the company also announced it would acquire oncology specialist, Tesaro, for $5.1 billion. The deal will give GSK control of ovarian cancer treatment, Zejula - a member of the class of poly ADP ribose polymerase (PARP) inhibitors. In March 2018, GSK announced that it has reached an agreement with Novartis to acquire Novartis’ 36.5% stake in their Consumer Healthcare Joint Venture for $13 billion (£9.2 billion). This acquisition is consistent with the notion prevalent by July 2018 that the company was seriously considering a breakup that would spin-off the company's Consumer division. In December 2018, GSK announced that it, along with Pfizer, had reached an agreement to merge and combine their consumer healthcare divisions into a single entity. The combined entity would have sales of around £9.8 billon ($12.7 billion), with GSK maintaining a 68% controlling stake in the joint venture. Pfizer would own the remaining 32% shareholding. The deal builds on an earlier 2018 deal where GSK bought out Novartis' stake in the GSK-Novartis consumer healthcare joint business. The culmination of the Consumer Healthcare string of deals will result in GSK splitting into two separate, via a demerger and subsequent listing of the joint venture, creating two publicly traded companies, one focusing on pharmaceuticals and research & development, the other on consumer healthcare. SR One was established in 1985 by SmithKline Beecham to invest in new biotechnology companies and continued operating after GSK was formed; by 2003 GSK had formed another subsidiary, GSK Ventures, to out-license or start new companies around drug candidates that it did not intend to develop further. As of 2003, SR One tended to invest only if the company aligned with GSK's business. Medicines historically discovered or developed at GSK and its legacy companies and now sold as generics include amoxicillin and amoxicillin-clavulanate, ticarcillin-clavulanate, mupirocin, and ceftazidime for bacterial infections, zidovudine for HIV infection, valacyclovir for herpes virus infections, albendazole for parasitic infections, sumatriptan for migraine, lamotrigine for epilepsy, bupropion and paroxetine for major depressive disorder, cimetidine and ranitidine for gastroesophageal reflux disorder, mercaptopurine and thioguanine for the treatment of leukemia, allopurinol for gout, pyrimethamine for malaria, and the antibacterial trimethoprim. Among these, albendazole, amoxicillin, amoxicillin-clavulanate, allopurinol, mercaptopurine, mupriocin, pyrimethamine, ranitidine, thioguanine, trimethoprim and zidovudine are listed on the World Health Organization's list of essential medications. In 2014, GSK applied for regulatory approval for the first malaria vaccine. Malaria is responsible for over 650,000 deaths annually, mainly in Africa. Known as RTS,S, the vaccine was developed as a joint project with the PATH vaccines initiative and the Bill and Melinda Gates Foundation. The company has committed to making the vaccine available in developing countries for five percent above the cost of production. As of 2013 RTS,S, which uses GSK's proprietary AS01 adjuvant, was being examined in a Phase 3 trial in eight African countries. PATH reported that "[i]n the 12-month period following vaccination, RTS,S conferred approximately 50% protection from clinical Plasmodium falciparum disease in children aged 5-17 months, and approximately 30% protection in children aged 6-12 weeks when administered in conjunction with Expanded Program for Immunization (EPI) vaccines." In 2014, Glaxo said it had spent more than $350 million and expected to spend an additional $260 million before seeking regulatory approval. A second generation malaria vaccine is being evaluated in Phase 2 clinical trials. GSK's consumer healthcare division, which earned £5.2 billion in 2013, sells oral healthcare, including Aquafresh, Maclean's and Sensodyne toothpastes; and drinks such as Horlicks, Boost and a chocolate-flavoured malt drink sold in India. GSK also previously owned the Lucozade and Ribena brands of soft drinks, but they were sold in 2013 to Suntory for £1.35bn. Other products include Abreva to treat cold sores; Night Nurse, a cold remedy; Breathe Right nasal strips; and Nicoderm and Nicorette nicotine replacements. In March 2014 it recalled Alli, an over-the-counter weight-loss drug, in the United States and Puerto Rico because of possible tampering, following customer complaints. Four GlaxoSmithKline scientists have been recognized by the Nobel Committee for their contributions to basic medical science and/or therapeutics development. Henry Dale, a former student of Paul Ehrlich, received the 1936 Nobel Prize in Medicine for his work on the chemical transmission of neural impulses. Dale served as a pharmacologist and then as Director of the Wellcome Physiological Research Laboratories from 1904 to 1914, and later served as Trustee and Chairman of the Board of the Wellcome Trust. John Vane of Wellcome Research Laboratories shared the 1982 Nobel Prize for Medicine for his work on prostaglandin biology and the discovery of prostacyclin. Vane served as Group Research and Development Director for The Wellcome Foundation from 1973 to 1985. Gertrude B. Elion and George Hitchings, both of the Wellcome Research Laboratories, shared the 1988 Nobel Prize in Medicine with Sir James W. Black ""for their discoveries of important principles for drug treatment"." Elion and Hitchings were responsible for the discovery of a plethora of important drugs, including mercaptopurine and thioguanine for the treatment of leukemia, the immunosuppressant azothioprine, allopurinol for gout, pyrimethamine for malaria, the antibacterial trimethoprim, acyclovir for herpes virus infection, and nelarabine for cancer treatment. Since 2010, GlaxoSmithKline has several times ranked first among pharmaceutical companies on the Global Access to Medicines Index, which is funded by the Bill and Melinda Gates Foundation. In 2014 the Human Rights Campaign, an LGBT-rights advocacy group gave GSK a score of 100 percent in its Corporate Equality Index. GSK has been active, with the World Health Organization (WHO), in the Global Alliance to Eliminate Lymphatic Filariasis (GAELF). Around 120 million people globally are believed to be infected with lymphatic filariasis. In 2012 the company endorsed the London Declaration on Neglected Tropical Diseases; it agreed to donate 400 million albendazole tablets to the WHO each year to fight soil-transmitted helminthiasis and to provide 600 million albendazole tablets every year for lymphatic filariasis until the disease is eradicated. As of 2014 over 5 billion treatments had been delivered, and 18 of 73 countries in which the disease is considered endemic had progressed to the surveillance stage. In 2009 the company said it would cut drug prices by 25 percent in 50 of the poorest nations, release intellectual property rights for substances and processes relevant to neglected disease into a patent pool to encourage new drug development, and invest 20 percent of profits from the least-developed countries in medical infrastructure for those countries. Médecins Sans Frontières welcomed the decision, but criticized GSK for failing to include HIV patents in its patent pool and for not including middle-income countries in the initiative. In 2013, GSK licensed its HIV portfolio to the Medicines Patent Pool for use in children, and agreed to negotiate a license for dolutegravir, an integrase inhibitor then in clinical development. In 2014 this license was extended to include dolutegravir and adults with HIV. The licenses include countries in which 93 percent of adults and 99 percent of children with HIV live. Also in 2013 GSK joined AllTrials, a British campaign to ensure that all clinical trials are registered and the results reported. The company said it would make its past clinical-trial reports available and future ones within a year of the studies' end. In July 2012 GSK pleaded guilty in the United States to criminal charges, and agreed to pay $3 billion, in what was the largest settlement until then between the Justice Department and a drug company. The $3 billion included a criminal fine of $956,814,400 and forfeiture of $43,185,600. The remaining $2 billion covered a civil settlement with the government under the False Claims Act. The investigation was launched largely on the basis of information from four whistleblowers who filed qui tam (whistleblower) lawsuits against the company under the False Claims Act. The charges stemmed from GSK's promotion of the anti-depressants Paxil (paroxetine) and Wellbutrin (bupropion) for unapproved uses from 1998–2003, specifically as suitable for patients under the age of 18, and from its failure to report safety data about Avandia (rosiglitazone), both in violation of the Federal Food, Drug, and Cosmetic Act. Other drugs promoted for unapproved uses were two inhalers, Advair (fluticasone/salmeterol) and Flovent (fluticasone propionate), as well as Zofran (ondansetron), Imitrex (sumatriptan), Lotronex (alosetron) and Valtrex (valaciclovir). The settlement also covered reporting false best prices and underpaying rebates owed under the Medicaid Drug Rebate Program, and kickbacks to physicians to prescribe GSK's drugs. There were all-expenses-paid spa treatments and hunting trips for doctors and their spouses, speakers' fees at conferences, and payment for articles ghostwritten by the company and placed by physicians in medical journals. The company set up a ghostwriting programme called CASPPER, initially to produce articles about Paxil but which was extended to cover Avandia. As part of the settlement GSK signed a five-year corporate integrity agreement with the Department of Health and Human Services, which obliged the company to make major changes in the way it did business, including changing its compensation programmes for its sales force and executives, and to implement and maintain transparency in its research practices and publication policies. It announced in 2013 that it would no longer pay doctors to promote its drugs or attend medical conferences, and that its sales staff would no longer have prescription targets. The 2012 settlement included a criminal fine of $242,612,800 for failing to report safety data to the FDA about Avandia (rosiglitazone), a diabetes drug approved in 1999, and a civil settlement of $657 million for making false claims about it. The Justice Department said GSK had promoted rosiglitazone to physicians with misleading information, including that it conferred cardiovascular benefits despite an FDA-mandated label warning of cardiovascular risks. In 1999 John Buse, a diabetes specialist, told medical conferences that rosiglitazone might carry an increased risk of cardiovascular problems. GSK threatened to sue him, called his university head of department, and persuaded him to sign a retraction. GSK raised questions internally about the drug's safety in 2000, and in 2002 the company ghostwrote an article in Circulation describing a GSK funded clinical trial that suggested rosiglitazone might have a beneficial effect on cardiovascular risk. From 2001 reports began to link the thiazolidinediones (the class of drugs to which rosiglitazone belongs) to heart failure. In April that year GSK began a six-year, open-label, randomized trial, known as RECORD, to examine rosiglitazone and cardiovascular events. Two GSK meta-analyses in 2005 and 2006 showed an increased risk of cardiovascular problems with rosiglitazone; the information was passed to the FDA and posted on the company website, but not otherwise published. By December 2006 rosiglitazone had become the top-selling diabetes drug, with annual sales of US$3.3 billion. In June 2007 the New England Journal of Medicine published a meta-analysis that associated the drug with an increased risk of heart attack. GSK had reportedly tried to persuade one of the authors, Steven Nissen, not to publish it, after receiving an advance copy from one of the journal's peer reviewers, a GSK consultant. In July 2007 FDA scientists suggested that rosiglitazone had caused 83,000 excess heart attacks between 1999 and 2007.:4 The FDA placed restrictions on the drug, including adding a boxed warning, but did not withdraw it. (In 2013 the FDA rejected that the drug had caused excess heart attacks.) A Senate Finance Committee inquiry concluded in 2010 that GSK had sought to intimidate scientists who had concerns about rosiglitazone. In February that year the company tried to halt publication of an editorial about the controversy by Nissen in the European Heart Journal. The results of GSK's RECORD trial were published in June 2009. It confirmed an association between rosiglitazone and an increased risk of heart failure and fractures, but not of heart attack, and concluded that it "does not increase the risk of overall cardiovascular morbidity or mortality compared with standard glucose-lowering drugs." Steven Nissan and Kathy Wolkski argued that the study's low event rates reduced its statistical power. 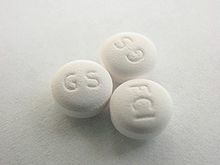 In September 2009 rosiglitazone was suspended in Europe. The results of the RECORD study were confirmed in 2013 by the Duke Clinical Research Institute, in an independent review required by the FDA. In November that year the FDA lifted the restrictions it had placed on the drug. The boxed warning about heart attack was removed; the warning about heart failure remained in place. GSK was fined for promoting Paxil/Seroxat (paroxetine) for treating depression in the under-18s, although the drug had not been approved for pediatric use. Paxil had $4.97 billion worldwide sales in 2003. The company conducted nine clinical trials between 1994 and 2002, none of which showed that Paxil helped children with depression. From 1998 to 2003 it promoted the drug for the under-18s, paying physicians to go on all-expenses paid trips, five-star hotels and spas. From 2004 Paxil's label, along with those of similar drugs, included an FDA-mandated boxed warning that it might increase the risk of suicidal ideation and behaviour in patients under 18. An internal SmithKline Beecham document said in 1998, about withheld data from two GSK studies: "It would be commercially unacceptable to include a statement that [pediatric] efficacy had not been demonstrated, as this would undermine the profile of paroxetine." The company ghostwrote an article, published in 2001 in the Journal of the American Academy of Child and Adolescent Psychiatry, that misreported the results of one of its clinical trials, Study 329. The article concluded that Paxil was "generally well tolerated and effective for major depression in adolescents." The suppression of the research findings is the subject of Side Effects (2008) by Alison Bass. 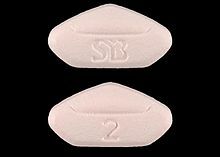 The company was also fined for promoting Wellbutrin (bupropion) – approved at the time for major depressive disorder and also sold as a smoking-cessation aid, Zyban – for weight loss and the treatment of attention deficit hyperactivity disorder, sexual dysfunction and substance addiction. GSK paid doctors to promote these off-label uses, and set up supposedly independent advisory boards and Continuing Medical Education programmes. In the 1960s Glaxo Group Ltd. (Glaxo) and Imperial Chemical Industries (ICI) each owned patents covering various aspects of the antifungal drug griseofulvin. :54, nn. 1–2 They created a patent pool by cross-licensing their patents, subject to express licensing restrictions that the chemical from which the "finished" form of the drug (tablets and capsules) was made must not be resold in bulk form, and they licensed other drug companies to sell the drug in finished form and subject to similar restrictions. :54–55 The effect and intent of the bulk-sale restriction was to keep the drug chemical out of the hands of small companies that might act as price-cutters, and the effect was to maintain stable, uniform prices. The United States brought an antitrust suit against the two companies—United States v. Glaxo Group Ltd.—charging them with violation of the Sherman Act and also seeking to have the patents declared invalid. :55 The trial court found that the defendants had engaged in several unlawful conspiracies, but dismissed the part of the suit seeking invalidation of patents and refused to grant as relief mandatory sales of the bulk drug chemical and compulsory licensing of the patents. :56 The government appealed to the Supreme Court, which reversed, in United States v. Glaxo Group Ltd., 410 U.S. 52 (1973). 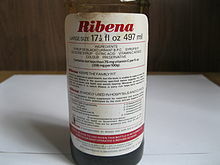 Old Ribena bottle, year unknown, made by Beecham Products, Brentford, Middlesex; the label states: "widely used in hospitals and clinics." There were concerns in the 2000s about the sugar and vitamin content of Ribena, a blackcurrant-based syrup and soft drink owned by GSK until 2013. Produced in England by H.W. Carter & Co from the 1930s, the company's unbranded syrup was distributed to children as a source of vitamin C during World War II, which gave the drink a reputation as good for health. Beecham bought H. W. Carter in 1955. In 2001 the British Advertising Standards Authority (ASA) required GSK to withdraw its claim that Ribena Toothkind, a lower-sugar variety, did not encourage tooth decay. A company poster showed bottles of Toothkind in place of the bristles on a toothbrush. The ASA's ruling was upheld by the High Court. In 2007 GSK was fined $217,000 in New Zealand over its claim that ready-to-drink Ribena contained high levels of vitamin C, after it was found to contain no detectable vitamin C. In 2013 GSK sold Ribena and another drink, Lucozade, to the Japanese multinational Suntory for £1.35 billion. In 2010 the US Department of Justice announced that GSK would pay a $150 million criminal fine and forfeiture, and a civil settlement of $600 million under the False Claims Act. The fines stemmed from production of improperly made and adulterated drugs from 2001 to 2005 at GSK's subsidiary, SB Pharmco Puerto Rico Inc., in Cidra, Puerto Rico, which at the time produced $5.5 billion of products each year. The drugs involved were Kytril, an antiemetic; Bactroban, used to treat skin infections; Paxil, the anti-depressant; and Avandamet, a diabetes drug. GSK closed the factory in 2009. According to the New York Times, the case began in 2002 when GSK sent experts to fix problems cited by the FDA. The lead inspector recommended recalls of defective products, but they were not authorised; she was fired in 2003 and filed a whistleblower lawsuit. In 2005 federal marshals seized $2 billion worth of products, the largest such seizure in history. In the 2010 settlement SB Pharmco plead guilty to criminal charges, and agreed to pay $150 million in a criminal fine and forfeiture, at that time the largest such payment ever by a manufacturer of adulterated drugs, and $600 million in civil penalties to settle the civil lawsuit. In 2013 Chinese authorities announced that, since 2007, GSK had funnelled HK$3.8 billion in kickbacks to GSK managers, doctors, hospitals and others who prescribed their drugs, using over 700 travel agencies and consulting firms. Chinese authorities arrested four GSK executives as part of a four-month investigation into claims that doctors were bribed with cash and sexual favours. In 2014 a Chinese court found the company guilty of bribery and imposed a fine of $490 million. Mark Reilly, the British head of GSK's Chinese operations, received a three-year suspended prison sentence after a one-day trial held in secret. Reilly was reportedly deported from China and dismissed by the company. In February 2016 the company was fined over £37 million in the UK by the Competition and Markets Authority for paying Generics UK, Alpharma and Norton Healthcare more than £50m between 2001 and 2004 to keep generic varieties of paroxetine out of the UK market. The generics companies were fined a further £8 million. At the end of 2003, when generics became available in the UK, the price of paroxetine dropped by 70 percent. Italian police sought bribery charges in May 2004 against 4,400 doctors and 273 GSK employees. GSK and its predecessor were accused of having spent £152m on physicians, pharmacists and others, giving them cameras, computers, holidays and cash. Doctors were alleged to have received cash based on the number of patients they treated with a cancer drug, topotecan (Hycamtin). The following month prosecutors in Munich accused 70–100 doctors of having accepted bribes from SmithKline Beecham between 1997 and 1999. The inquiry was opened over allegations that the company had given over 4,000 hospital doctors money and free trips. All charges were dismissed by the Verona court in January 2009. In 2006 in the United States GSK settled the largest tax dispute in IRS history, agreeing to pay $3.1 billion. At issue were Zantac and other products sold in 1989–2005. The case revolved around intracompany transfer pricing—determining the share of profit attributable to the US subsidiaries of GSK and subject to tax by the IRS. The UK's Serious Fraud Office (SFO) opened a criminal inquiry in 2014 into GSK's sales practices, using powers granted by the Bribery Act 2010. The SFO said it was collaborating with Chinese authorities to investigate bringing charges in the UK related to GSK's activities in China, Europe and the Middle East. Also as of 2014 the US Department of Justice was investigating GSK with reference to the Foreign Corrupt Practices Act. ^ Glaxo Wellcome was formed from Glaxo's 1995 acquisition of The Wellcome Foundation and SmithKline Beecham from the 1989 merger of the Beecham Group and the SmithKline Beckman Corporation. ^ World Health Organization Expert Committee on Drug Dependence, 2003: "The Committee noted the striking number of reports on paroxetine and 'withdrawal syndrome' ... The representative of Consumers International reported that a number of patients had experienced difficulty in withdrawing from SSRIs in general. It was agreed that withdrawal was indeed a problem in some patients, but there was a difference of opinion on the degree of dependence that was involved, given the possibility that the need for treatment of resistant or relapsing disease could make these drugs indispensable for patient care. The Committee expressed concern about the possibility of inappropriate prescribing resulting in the risk of problems of withdrawal outweighing the benefits of treatment with SSRIs." ^ a b c "Preliminary Results 2018" (PDF). Retrieved 3 March 2019. ^ "GlaxoSmithKline". Statista. Retrieved 3 March 2019. ^ "GlaxoSmithKline on the Forbes Top Multinational Performers List". Forbes. Retrieved 11 December 2017. ^ "The World's Biggest Public Companies", 2015 ranking, Forbes. ^ Herper, Matthew. "GlaxoSmithKline Appoints Big Pharma's First Woman Chief Executive". Forbes. Retrieved 11 December 2017. ^ "FTSE All-Share Index Ranking". stockchallenge.co.uk. ^ a b c "Annual Report 2013" (PDF). GlaxoSmithKline. Retrieved 26 May 2014. ^ "Products". GlaxoSmithKline plc. Retrieved 16 November 2013. ^ a b Plumridge, Hester (24 July 2014). "Glaxo Files Its Entry in Race for a Malaria Vaccine". Wall Street Journal. Lorenzetti, Laura (24 July 2014). "GlaxoSmithKline seeks approval on first-ever malaria vaccine". Fortune. ^ a b c d e f g h i j k "GlaxoSmithKline to Plead Guilty and Pay $3 Billion to Resolve Fraud Allegations and Failure to Report Safety Data", United States Department of Justice, 2 July 2012. Katie Thomas and Michael S. Schmidt, "Glaxo Agrees to Pay $3 Billion in Fraud Settlement", The New York Times, 2 July 2012. Simon Neville, "GlaxoSmithKline fined $3bn after bribing doctors to increase drugs sales", The Guardian, 3 July 2012. ^ R. P. T. Davenport-Hines, Judy Slinn, Glaxo: A History to 1962, Cambridge University Press, 1992, pp. 7–13. ^ David Newton, Trademarked: A History of Well-Known Brands, from Airtex to Wright's Coal Tar, The History Press, 2012, p. 435. ^ a b c d David J. Ravenscraft, William F. Long, "Paths to Creating Value in Pharmaceutical Mergers," in Steven N. Kaplan (ed. ), Mergers and Productivity, University of Chicago Press, 2000. ^ a b c d e f "GSK History". GlaxoSmithKline. Archived from the original on 8 June 2011. Retrieved 18 April 2011. ^ 1664-1964 "The Story of a Town", Tricentennial Committee. ^ Peter Pennoyer, Anne Walker, The Architecture of Delano & Aldrich, W. W. Norton & Company, 2003, p. 188. ^ "Iconic Burroughs Wellcome Headquarters Open for Rare Public Tour", Triangle Modernist Houses, press release, 8 October 2012. ^ Katherine Bouton, "The Nobel Pair", The New York Times, 29 January 1989. ^ Mark S. Lesney, "The ghosts of pharma past", Modern Drug Discovery, January 2004, pp. 25–26. ^ "10,000 face Glaxo's axe at Wellcome". The Independent. 15 June 1995. ^ Grimond, Magnus (21 June 1995). "Glaxo warns of redundancies". The Independent. ^ Grimond, Magnus (7 September 1995). "Glaxo Wellcome plans to axe 7,500 jobs". The Independent. ^ "Glaxo to Acquire Affymax", The New York Times, 27 January 1995. ^ "Outlook: Glaxo Wellcome". The Independent. 30 March 1999. ^ "Company of the week: Glaxo Wellcome". The Independent. 1 August 1999. ^ "Profile: Glaxo Wellcome". BBC News. 17 January 2000. ^ Corely, T.A.B. (2011). Beechams, 1848-2000: from Pills to Pharmaceuticals. Crucible Books. ISBN 978-1905472147. ^ "The new alchemy – The drug industry's flurry of mergers is based on a big gamble". The Economist. 20 January 2000. ^ Gershon Diane (11 May 2000). "Partners resolve their differences and unite at the second attempt". Nature. 405 (6783): 258. doi:10.1038/35012210. ^ "Hall that glitters isn't shareholder gold". The Daily Telegraph. 15 July 2002. ^ "GlaxoSmithKline Completes the Purchase of Block Drug for $1.24 Billion". PR Newswire. Retrieved 1 August 2010. ^ Stouffer, Rick (9 October 2006). "Glaxo unit buys Breathe Right maker". Trib Live. ^ "Sir Christopher Gent to exit GlaxoSmithKline", The Daily Telegraph, 28 October 2012. ^ Ben Hirschler (24 May 2007). "Glaxo China R&D centre to target neurodegeneration". Reuters. Cyranoski, David (29 October 2008). "Pharmaceutical futures: Made in China?". Nature. ^ "Andrew Witty's journey from Graduate to GSK CEO", GlaxoSmithKline, 12 August 2008; "Andrew Philip Witty", Bloomberg. ^ Ruddick, Graham (20 April 2009). "GlaxoSmithKline buys Stiefel for $3.6bn". The Daily Telegraph. ^ "FDA Approves Additional Vaccine for 2009 H1N1 Influenza Virus". US Food and Drug Administration (FDA). 16 November 2009. ^ Jack, Andrew (16 April 2009). "Companies / Pharmaceuticals – GSK and Pfizer to merge HIV portfolios". Financial Times. ^ GSK Acquires Laboratorios Phoenix for $253m, InfoGrok. ^ Sandle, Paul (13 December 2010). "UPDATE 2-Glaxo buys protein-drinks firm Maxinutrition". Reuters. ^ Ranii, David (21 December 2011). "GSK sells BC, Goody's and other brands". News & Observer. Archived from the original on 15 April 2012. ^ "GSK confirms 500 mln stg UK investment plans", Reuters, 22 March 2012. ^ Matthew Herper, "Three Lessons From GlaxoSmithKline's Purchase Of Human Genome Sciences", Forbes, 16 July 2012. ^ Hirschler, Ben (10 March 2014). "GSK pays $1 billion to lift Indian unit stake to 75 percent". Reuters. Retrieved 10 March 2014. ^ Chad Bray, David Jolly, "Novartis and Glaxo Agree to Trade $20 Billion in Assets", The New York Times', 22 April 2014. ^ Jonathan D. Rockoff, Jeanne Whalen, Marta Falconi, "Deal Flurry Shows Drug Makers' Swing Toward Specialization", The Wall Street Journal, 22 April 2014. ^ "GEN - News Highlights:GSK Acquires GlycoVaxyn for $190M". GEN.
^ "Pfizer Buys Two GSK Meningitis Vaccines for $130M". GEN. Retrieved 25 March 2016. ^ James Quinn, "Sir Philip Hampton to chair Glaxo", The Daily Telegraph, 25 September 2014. ^ Yeomans, Jon (20 September 2016). "Emma Walmsley becomes latest female CEO in FTSE 100 as she replaces Sir Andrew Witty at GSK". Daily Telegraph, London. Retrieved 20 September 2016. ^ "GlaxoSmithKline boosts stake in Saudi Arabia unit". 18 December 2017 – via Reuters. ^ a b "GlaxoSmithKline considers splitting up the group - FT". Reuters. 21 July 2018. Retrieved 23 July 2018. ^ a b "Unilever in pole position to swallow GSK's Indian Horlicks business". 28 November 2018. Retrieved 28 November 2018. ^ "GlaxoSmithKline taps Unilever as lead bidder in Indian Horlicks buyout: report". FiercePharma. Retrieved 28 November 2018. ^ "Unilever swallows GSK's Indian Horlicks business for $3.8 billion". Reuters. 3 December 2018. Retrieved 3 December 2018. ^ "GSK slides after buying cancer firm Tesaro for hefty $5.1 billion". Reuters. 3 December 2018. Retrieved 3 December 2018. ^ "GSK buys out Novartis in $13 billion consumer healthcare shake-up". Reuters. 27 March 2018. Retrieved 27 March 2018. ^ a b "Drugmaker GSK to split after striking Pfizer consumer health deal". Reuters. 19 December 2018. Retrieved 19 December 2018. ^ a b Reaume, Andrew (1 January 2003). "Is Corporate Venture Capital a Prescription for Success in the Pharmaceutical Industry?". The Journal of Private Equity. 6 (4): 77–87. doi:10.3905/jpe.2003.320058. JSTOR 43503355. ^ "Most-recognized brands: Anti-infectives, December 2013". Drugs.com. ^ Geddes AM, et al. (December 2007). "Introduction: historical perspective and development of amoxicillin/clavulanate". Int J Antimicrob Agents. 30 (Suppl 2): S109–12. doi:10.1016/j.ijantimicag.2007.07.015. PMID 17900874. ^ Brown AG (August 1986). "Clavulanic acid, a novel beta-lactamase inhibitor--a case study in drug discovery and development". Drug des Deliv. 1 (1): 1–21. PMID 3334541. ^ "Search". Food and Drug Administration. ^ D. M. Richards; R. N. Brogden (February 1985). "Ceftazidime. A review of its antibacterial activity, pharmacokinetic properties and therapeutic use". Drugs. 29 (2): 105–61. doi:10.2165/00003495-198529020-00002. PMID 3884319. ^ a b "6-Mercaptopurine". Chemical & Engineering News. ^ a b c d "George Hitchings and Gertrude Elion". Science History Institute. ^ a b Elion GB (1989). "The purine path to chemotherapy". Science. 244 (4900): 41–7. doi:10.1126/science.2649979. PMID 2649979. ^ a b Lawrence K. Altman (23 February 1999). "Gertrude Elion, Drug Developer, Dies at 81". The New York Times. ^ "WHO Model List of Essential Medicines. 18th list" (PDF). World Health Organization. October 2013. ^ "Glaxo Files Its Entry in Race for a Malaria Vaccine". Wall Street Journal. ^ "Press release: Malaria vaccine candidate reduces disease over 18 months of follow-up in late-stage study of more than 15,000 infants and young children". PATH. ^ Birkett, A. J.; et al. (April 2013). "Malaria vaccine R&D in the Decade of Vaccines: breakthroughs, challenges and opportunities". Vaccine. 31 (Supplement 2): B233–43. doi:10.1016/j.vaccine.2013.02.040. PMID 23598488. ^ "Malaria vaccine candidate reduces disease over 18 months of follow-up in late-stage study of more than 15,000 infants and young children". GlaxoSmithKline. Archived from the original on 7 April 2014. ^ Donald G. McNeil Jr (18 October 2011). "Glaxo's RTS,S Malaria Vaccine Shows Promise, Scientists Say". The New York Times. ^ "Product pipeline | GSK". ^ Majumdar, Ramanuj (2007). Product management in India (3rd ed.). PHI Learning. p. 242. ISBN 978-81-203-3383-3. ^ Aaron Smith, "Alli weight-loss drug recalled for tampering", CNN, 27 March 2014. ^ "Sir Henry Dale - Biographical". ^ "John R. Vane - Biographical". ^ Maltzman JS, Koretzky GA (April 2003). "Azathioprine: old drug, new actions". J. Clin. Invest. 111 (8): 1122–4. doi:10.1172/JCI18384. PMC 152947. PMID 12697731. ^ Elion GB (1993). "Acyclovir: discovery, mechanism of action, and selectivity". J. Med. Virol. Suppl 1: 2–6. doi:10.1002/jmv.1890410503. PMID 8245887. ^ Koenig R (2006). "The legacy of great science: the work of Nobel Laureate Gertrude Elion lives on". Oncologist. 11 (9): 961–5. doi:10.1634/theoncologist.11-9-961. PMID 17030634. ^ "Access to medicine" (PDF). Archived from the original (PDF) on 7 February 2014. ^ "Global alliance to eliminate Lymphatic Filariasis". Ifpma.org. Archived from the original on 27 December 2008. ^ "Private and Public Partners Unite to Combat 10 Neglected Tropical Diseases by 2020". Bill & Melinda Gates Foundation. 30 January 2012. "Research-based pharma pledges on neglected tropical diseases". The Pharma Letter. 31 January 2012. ^ "Global programme to eliminate lymphatic filariasis: progress report, 2014" (PDF). World Health Organization. 18 September 2015. p. 490. ^ Sarah Boseley, "Drug giant GlaxoSmithKline pledges cheap medicine for world's poor", The Guardian, 13 February 2009. ^ Tido von Schoen-Angerer, Letter to the editor, The Guardian, 16 February 2009. ^ "GlaxoSmithKline unit joins patent pool for AIDS drugs | Reuters". ^ "Medicines Patent Pool, ViiV Healthcare Sign Licence for the Most Recent HIV Medicine to Have Received Regulatory Approval". Medicines Patent Pool. ^ Ben Goldacre, Bad Pharma, Fourth Estate, 2013 , p. 387. ^ Max Baucus, Chuck Grassley, "Finance Committee Letter to the FDA Regarding Avandia", United States Senate Finance Committee, 12 July 2010. Jim Edwards, "Inside GSK's CASSPER Ghostwriting Program", CBS News, 21 August 2009. ^ "GSK to stop paying doctors in major marketing overhaul", Thomson/Reuters, 17 December 2013. ^ "The Intimidation of Dr. John Buse and the Diabetes Drug Avandia", Committee on Finance, United States Senate, November 2007, pp. 2–4. ^ Max Baucus, Chuck Grassley, "Finance Committee Letter to the FDA Regarding Avandia", United States Senate Finance Committee, 12 July 2010; for internal concerns, p. 2 and attachment E, pp. 20–35; for ghostwriting, p. 3 and attachment H, pp. 58–109; for the ghostwriting, attachment I, p. 110ff; for cover letter to Circulation, attachment I, p. 143; for the ghostwritten article, attachment I, pp. 152–158. Haffner SM, et al. (2002). "", 2002 "Effect of Rosiglitazone Treatment on Nontraditional Markers of Cardiovascular Disease in Patients With Type 2 Diabetes Mellitus". Circulation. 106 (6): 679–684. doi:10.1161/01.CIR.0000025403.20953.23. PMID 12163427. ^ a b Nissen SE (2010). "The rise and fall of rosiglitazone". European Heart Journal. 31 (7): 773–776. doi:10.1093/eurheartj/ehq016. PMID 20154334. see table 1 for timeline. "RECORD: Rosiglitazone Evaluated for Cardiac Outcomes and Regulation of Glycaemia in Diabetes", clinicaltrials.gov. ^ Nissen SE, Wolski K (2007). "Effect of Rosiglitazone on the Risk of Myocardial Infarction and Death from Cardiovascular Causes". New England Journal of Medicine. 356 (24): 2457–2471. doi:10.1056/NEJMoa072761. PMID 17517853. Rosiglitazone was associated with a significant increase in the risk of myocardial infarction and with an increase in the risk of death from cardiovascular causes that had borderline significance. ^ Stephanie Saul, "Doctor Accused of Leak to Drug Maker", The New York Times, 30 January 2008. Gardiner Harris, "A Face-Off on the Safety of a Drug for Diabetes", The New York Times, 22 February 2010. ^ a b "Staff report on GlaxoSmithKline and the diabetes drug Avandia", Committee on Finance, United States Senate, January 2010. "Grassley, Baucus Release Committee Report on Avandia", The United States Senate Committee on Finance, 20 February 2010. Andrew Clark, "Glaxo's handling of Avandia concerns damned by US Senate committee", The Guardian, 22 February 2010. ^ David Graham, "Assessment of the cardiovascular risks and health benefits of rosiglitazone", Office of Surveillance and Epidemiology, Food and Drug Administration, 30 July 2007. ^ "FDA Adds Boxed Warning for Heart-related Risks to Anti-Diabetes Drug Avandia. Agency says drug to remain on market, while safety assessment continues", Food and Drug Administration, 14 November 2007. ^ a b "FDA Drug Safety Communication: FDA requires removal of some prescribing and dispensing restrictions for rosiglitazone-containing diabetes medicines". Food and Drug Administration. 25 November 2013. Avandia. Prescribing information", Food and Drug Administration. ^ Thomas F. Lüscher; Ulf Landmesser; Frank Ruschitzka (23 April 2010). "Standing firm—the European Heart Journal, scientific controversies and the industry". European Heart Journal. 31 (10): 1157–1158. doi:10.1093/eurheartj/ehq127. ^ "European Medicines Agency recommends suspension of Avandia, Avandamet and Avaglim", European Medicines Agency, 23 September 2010. ^ "FDA requires removal of certain restrictions on the diabetes drug Avandia", Food and Drug Administration, 25 November 2013. "Readjudication of the Rosiglitazone Evaluated for Cardiovascular Outcomes and Regulation of Glycemia in Diabetes Trial (RECORD)", Joint Meeting of the Endocrinologic and Metabolic Drugs Advisory Committee and the Drug Safety and Risk Management Advisory Committee, Food and Drug Administration, 5–6 June 2013. Steven Nissen, "Steven Nissen: The Hidden Agenda Behind The FDA's New Avandia Hearings", Forbes, 23 May 2013. "The FDA Responds To Steve Nissen's Criticism Of Upcoming Avandia Meeting", Forbes, 23 May 2013. ^ a b W. Kondro; B. Sibbald (March 2004). "Drug company experts advised staff to withhold data about SSRI use in children". Canadian Medical Association Journal. 170 (5): 783. doi:10.1503/cmaj.1040213. PMC 343848. PMID 14993169. ^ Goldacre 2013, p. 58. ^ Samson, Kurt (December 2008). "Senate probe seeks industry payment data on individual academic researchers". Annals of Neurology. 64 (6): A7–9. doi:10.1002/ana.21271. PMID 19107985. ^ Letter showing authorship of Study 239, Drug Industry Document Archive, University of California, San Francisco. Isabel Heck, "Controversial Paxil paper still under fire 13 years later", The Brown Daily Herald, 2 April 2014. "Company hid suicide link", BBC News, 29 January 2007; "Secrets of the Drug Trials," BBC Panorama, 29 January 2007; Goldacre 2013, pp. 296–297. ^ Alison Bass (2008). Side Effects: A Prosecutor, a Whistleblower, and a Bestselling Antidepressant on Trial. Algonquin Books of Chapel Hill. ^ Angell, Marcia (15 January 2009). "Drug Companies & Doctors: A Story of Corruption". The New York Review of Books. 56 (1). ^ "Judge: Paxil ads can't say it isn't habit-forming". Associated Press. 20 August 2002. ^ a b "WHO Expert Committee on Drug Dependence", Thirty-third Report, World Health Organization, 2003, pp. 20, 25. ^ a b c d United States v. Glaxo Group Ltd., 410 U.S. 52 (1973). ^ a b c d e LaHatte, Gabrielle (2011). "Reverse Payments: When the Federal Trade Commission can Attack the Validity of Underlying Patents". Case Western Reserve Journal of Law, Technology & the Internet. 2: 37–73. Retrieved 19 June 2015. ^ Leslie, Christopher R. (2011). Antitrust Law and Intellectual Property Rights: Cases and Materials. Oxford University Press. pp. 574–75. ISBN 9780195337198. ^ United States v. Glaxo Group Ltd. at 62-63. ^ Jacobson, Jonathan M. (2007). Antitrust Law Developments. American Bar Association. p. 1162. ISBN 9781590318676. ^ Oliver Thring, "Consider squash and cordial", The Guardian, 7 September 2010. "We have Frank and Vernon to thank for Ribena", The Bristol Post, 17 September 2013. 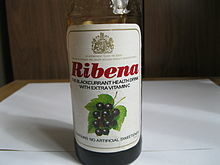 ^ Linus Gregoriadis, "Makers of Ribena lose fight over anti-decay claims", The Daily Telegraph, 18 January 2001. ^ Eames, David (28 March 2007). "Judge orders Ribena to fess up". The New Zealand Herald. Tony Jaques, "When an Icon Stumbles – The Ribena Issue Mismanaged", Corporate Communications: An International Journal, 13(4), 2008, pp. 394–406. Michael Regester, Judy Larkin, Risk Issues and Crisis Management in Public Relations, Kogan Page Publishers, 2008, p. 67ff. ^ "GlaxoSmithKline to Plead Guilty & Pay $750 Million to Resolve Criminal and Civil Liability Regarding Manufacturing Deficiencies at Puerto Rico Plant", U.S. Department of Justice, 26 October 2010. ^ a b "Glaxo to Pay $750 Million for Sale of Bad Products". The New York Times. 27 October 2010. ^ Alice Yan; Toh Han Shih (16 July 2013). "Shanghai travel agent's revenue surge led to arrests in GSK bribery case". South China Morning Post. "GlaxoSmithKline executives face China bribery probe". BBC News. 11 July 2013. ^ Rupert Neate and Angela Monaghan, "GlaxoSmithKline admits some staff in China involved in bribery", The Guardian, 22 July 2013. Rupert Neate, "GSK’s China crisis: chief executive Andrew Witty speaks - as it happened", The Guardian, 24 July 2013. Philips, Tom (26 July 2013). "Chinese police allege Glaxo sales reps trained to offer sexual bribes". The Daily Telegraph. ^ "China Fines GlaxoSmithKline Nearly $500 Million in Bribery Case - The New York Times". ^ Malcolm Moore, Denise Roland, "China fines Glaxo £297m for bribery, Mark Reilly sentenced", The Daily Telegraph, 19 September 2014. ^ Bradshaw, Julia (12 February 2016). "Watchdog fines GSK £37m for paying to keep generic drugs out of UK market". The Daily Telegraph. ^ John Hooper, Heather Stewart, "Over 4,000 doctors face charges in Italian drugs scandal", The Guardian, 27 May 2004. ^ Jane Burgermeister, "German prosecutors probe again into bribes by drug companies", BMJ, 328, 5 June 2004; "Glaxo probed over doctor freebies", BBC News, 12 March 2002. ^ "GlaxoSmithKline Annual Report pg 177" (PDF). Retrieved 8 October 2015. ^ "GlaxoSmithKline to Settle Tax Dispute With U.S.", Reuters, 12 September 2006; "IRS Accepts Settlement Offer in Largest Transfer Pricing Dispute", IRS, 11 September 2006. ^ Kollewe, Julia (28 May 2014). "GlaxoSmithKline faces criminal investigation by Serious Fraud Office". The Guardian. ^ Kirsten Ridley, "UK fraud office liaising with China on GSK bribery case", Reuters, 23 July 2014. ^ "GlaxoSmithKline faces bribery claims in Syria", Reuters, 12 August 2014.